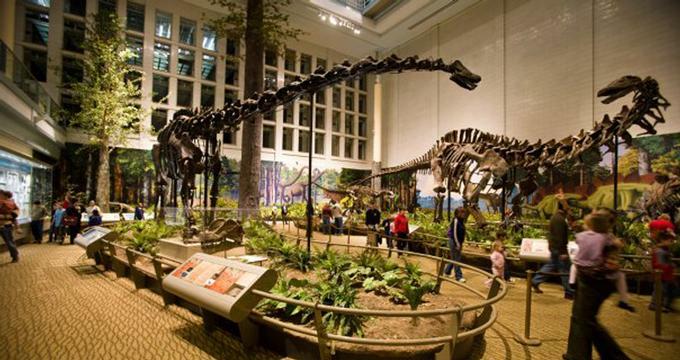 The Carnegie Museum of Natural History in Pittsburgh has a collection of around 22 million specimens and objects that are showcased to develop a greater understanding of biodiversity, conservation, and evolution. The museum is one of Pittsburgh's four Carnegie museums, and is considered to be one of best museums of natural history in the United States. The museum's Dinosaurs in Their Time exhibit is the first permanent exhibit to feature an immersive scientifically correct environment that spans the Mesozoic Era, or Age of Dinosaurs, and is chronologically organized and contains actively posed original fossils. 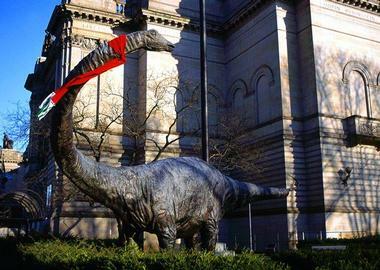 The Carnegie Museum of Natural History possesses one of the top dinosaur collections worldwide with almost 75 percent of its exhibits containing actual fossils. There is more to the exhibition, however, than just dinosaur fossils. The museum also showcases mammals, birds, turtles, amphibians, fish, and plants that lived alongside the dinosaurs. The exhibit also demonstrates the effects of climate and continental changes on the evolution of various species over the time period. There are numerous interactive touchscreens that provide more in depth information on the different dioramas and species, as well as several other hands-on activities throughout the exhibition. The PaleoLab offers visitors a chance to watch fossils being prepared to put on display and studied. Guests can also visit the Bonehunters Quarry to discover fossils of dinosaurs and mammals in a hands-on fossil dig. The Dinoguide provides detailed information about 13 different dinosaur species visitors will find throughout the exhibit, and visitors can also learn more about the museum's first dinosaur in the Dippy, This Is Your Life online exhibit. The constantly changing nature of our planet is highlighted in the Carnegie Museum of Natural History's Benedum Hall of Geology. The hall is comprised of four domes, three of which showcase fossils, shaping the earth, geological time and dating, and the local Pittsburgh geology. The fourth dome features the origin, economic development, and location of oil, gas, and coal. The Shaping the Earth exhibit area within the hall introduces visitors to the idea that the Earth's surface is continually sliding, shifting, crumping, word down in one place, and built up in another place. It contains a program demonstrating how the Pittsburgh area has gone through extreme change as an example. Guests can learn how fossils give us insight into life in the past, as well as knowledge about ancient climate and geography in the Fossils and Fossilization area. Visitors can step inside the Stratavator to explore below the museum, 16 feet into the earth. This simulated elevator ride makes stops at the natural history museum's basement, a limestone cave, and a coal mine among other places. Rock strata flies by between elevator stops as the cab vibrates during the simulation. The exhibit area's Coal Forest, a preexisting carboniferous forest, is now a diorama demonstrating what Pittsburgh looked like 300 million years ago. There are also several interactive activities that provide knowledge on a variety of topics, such as the movements of continents, Pennsylvania's layered stratigraphy, and the radiometric dating of fossils and rocks. 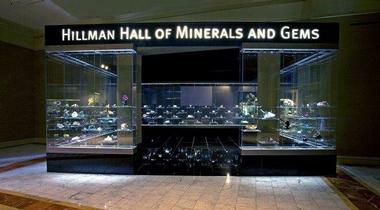 The Hillman Hall of Minerals and Gems displays over 1,300 gems and minerals from across the globe. The hall showcases a large array of minerals and gems, such as calcite and quartz. Lithology, which is the science of rock, as well as mineral locality suites and twinning are also on display to create a more enhanced visual and educational visitor experience. In addition the main Hillman Hall, the exhibition now features the Wertz Hall of Gems and Jewelry. Wertz Hall is a new exhibit gallery with an emphasis on gems and the crystals they come from, as well as jewelry that is made with the gems. Hillman Hall's Master Gallery contains almost 100 dazzling specimens, demonstrating the exhibition's underlying premise: "Minerals as Art." The Fluorescence and Phosphorescence Room shows how minerals can glow with a variety of colors due to ultraviolet radiation to create a spectacular light show. Visitors can also explore the feel of a huge piece of "float" copper, and discover a "miniature world of minerals" through a microscope. Cenozoic Hall features mostly fossils of mammals that existed during the past 66 million years during the Cenozoic Era, or also know as the Age of Mammals. The exhibit showcases much of the paleontological collection of the Carnegie Museum of Natural History. The Pleistocene exhibit area provides visitors with the sight of fossil skeletons of many significant species from the Ice Age, such as the Columbian mammoth, Dire Wolf, Giant Ground Sloth, and a Saber-toothed cat. There are also fossil specimens collected at what is now known as the Agate Fossils Beds National Monument, located in western Nebraska. Carnegie scientist discovered a collection of around 200 million year old fossils of mammals from 1900 to 1908. Guests can also explore and study fossils of more bizarre creatures from the past, including the horse-like Moropus and the warthog-like Dinohyus, and discover bones of the rhino-like Menoceras in a "bone bed." 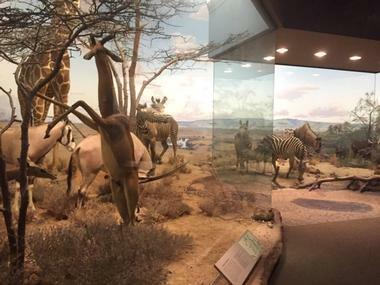 Four of Africa's significant life zone are highlighted in the Hall of African Wildlife: desert, savanna, mountain, and rainforest. The exhibit also features the different animals that call these areas home. 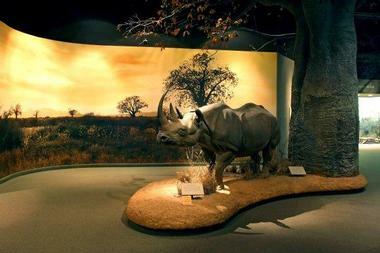 The hall features various dioramas that give visitors a glimpse into the life of African wildlife. These dioramas include a lowland gorilla among lush tropical foliage and vines and a watering hole surrounded by zebra, giraffe, wildebeest, and African buffalo. The exhibition hall also features a desert biome that showcases the ecosystem's unique animals like the fennec, an elusive small fox that has huge ear and large eyes. The Hall of North American Wildlife showcases several of the most fascinating animal species on the continent through dioramas of their natural habitats. Five different ecosystems are represented in the exhibition hall: coniferous forest, grassland, desert, deciduous forest, and tundra. In the Yellowstone National Park diorama, Bull Elk battle over a cow herd. In Canada's Belchers Islands, walruses bask on the rocky shore of the Hudson Bay. Guests can see goats in the Canadian Rocky Mountains, and pronghorns galloping in the air across the prairie as the fastest mammal in North America. The largest cat in both North and South American, the jaguar, hasn't been seen in the United States since the mid-20th century. The jaguar at the Carnegie Museum of Natural History is from 1910, found around Tamaulipas, Mexico. The exhibit also features interactive activities, such as categorizing a creature is an invertebrate or a vertebrate. Botany Hall demonstrates the outstanding diversity of our planet's plant life, showcasing four unique ecosystems of the United States: an alpine meadow in Mount Rainier, a valley in Pennsylvania, a Florida everglade, and the desert in Arizona. Each of the exhibit areas shows how the changing water and temperature conditions affect the plants in each biome, illustrating an in depth perspective of plant life by recreating their habitats. Another focus of Botany Hall is how plants are used in our lives. There are several exhibit areas that showcase how plants are not only used for food, but also how they are used in industry and medicine. One of these exhibits depicts an herb garden from western Pennsylvania, while others feature edible nuts and fruits and plant fibers. The Population Impact exhibit spotlights the findings of Carnegie Scientists on how our world is affected by the choices humans make. The exhibition hall emphasizes real-world issues, including urbanization, the affect of human population on animal and plant conservation, and human population through history. One feature of the exhibit is the display demonstrating the affects of population growth on four flourishing cities. There are also displays of how science and medicine change populations, as well as a map of population changes across the human history timeline. The Carnegie Museum of Natural History seeks to explain the society of ancient Egypt through the Walton Hall of Ancient Egypt. The hall highlights the evolution of complex society and agriculture's origins. Walton Hall is guided by six different themes: Daily Life, Cultural Evolution and History, Social Organization, World View, Funerary Religion, and Nautical Tradition. Each theme is demonstrated by over 600 artifacts, such as tools, ceramic and stone vessels, stelae and relief fragments, and jewelry. There are now over 2,500 artifacts from ancient Egypt in the museum's collection, some originating from all the way back to 3100 BC. Among other things, the hall features an 3,800 year old authentic funeral boat that was discovered in 1894 near Cairo, and a mummy which was donated by Andrew Carnegie as the hall's first exhibit piece. There is also an interactive video kiosk that displays information on a wide range of topics about life in ancient Egypt. The museum's Wyckoff Hall showcases an exhibit focused on Canadian Inuit, one of the largest exhibitions of its kind in the continent. The exhibition focuses on the colonization of northern Canada by the Canadian Inuit over the past 4,500 years, featuring Inuit prints and sculptures. The Needle to the North exhibit, a new exhibit in the hall detailing research by the museum in the Arctic from 1901 to 2004, is comprised of flora and fauna specimens, photographs from the J. Kenneth Doubt in 1938 and the Dale S. Nudge in 2004 Belcher Islands expeditions, and field equipment used by early expeditions. There are also maps and drawings illustrating the routes of early traders and explorers, as well as original artifacts representing the whaling industry.